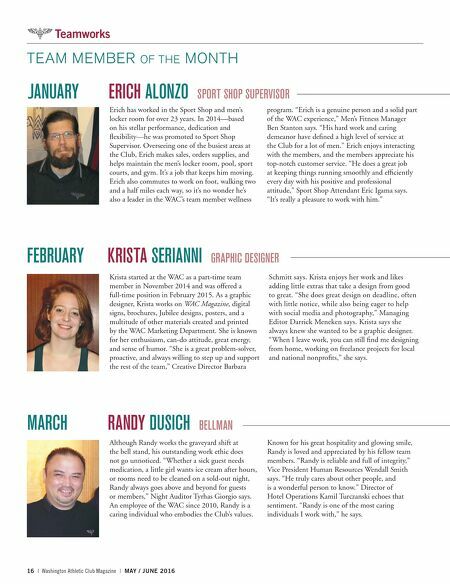 16 | Washington Athletic Club Magazine | MAY / JUNE 2016 Teamworks JANUARY ERICH ALONZO SPORT SHOP SUPERVISOR FEBRUARY KRISTA SERIANNI GRAPHIC DESIGNER Krista started at the WAC as a part-time team member in November 2014 and was offered a full-time position in February 2015. As a graphic designer, Krista works on WAC Magazine, digital signs, brochures, Jubilee designs, posters, and a multitude of other materials created and printed by the WAC Marketing Department. She is known for her enthusiasm, can-do attitude, great energy, and sense of humor. "She is a great problem-solver, proactive, and always willing to step up and support the rest of the team," Creative Director Barbara Schmitt says. Krista enjoys her work and likes adding little extras that take a design from good to great. "She does great design on deadline, often with little notice, while also being eager to help with social media and photography," Managing Editor Darrick Meneken says. Krista says she always knew she wanted to be a graphic designer. "When I leave work, you can still find me designing from home, working on freelance projects for local and national nonprofits," she says. Erich has worked in the Sport Shop and men's locker room for over 23 years. In 2014—based on his stellar performance, dedication and flexibility—he was promoted to Sport Shop Supervisor. Overseeing one of the busiest areas at the Club, Erich makes sales, orders supplies, and helps maintain the men's locker room, pool, sport courts, and gym. It's a job that keeps him moving. Erich also commutes to work on foot, walking two and a half miles each way, so it's no wonder he's also a leader in the WAC's team member wellness program. "Erich is a genuine person and a solid part of the WAC experience," Men's Fitness Manager Ben Stanton says. "His hard work and caring demeanor have defined a high level of service at the Club for a lot of men." Erich enjoys interacting with the members, and the members appreciate his top-notch customer service. "He does a great job at keeping things running smoothly and efficiently every day with his positive and professional attitude," Sport Shop Attendant Eric Igama says. "It's really a pleasure to work with him." MARCH RANDY DUSICH BELLMAN TEAM MEMBER OF THE MONTH Although Randy works the graveyard shift at the bell stand, his outstanding work ethic does not go unnoticed. "Whether a sick guest needs medication, a little girl wants ice cream after hours, or rooms need to be cleaned on a sold-out night, Randy always goes above and beyond for guests or members," Night Auditor Tyrhas Giorgio says. An employee of the WAC since 2010, Randy is a caring individual who embodies the Club's values. Known for his great hospitality and glowing smile, Randy is loved and appreciated by his fellow team members. "Randy is reliable and full of integrity," Vice President Human Resources Wendall Smith says. "He truly cares about other people, and is a wonderful person to know." Director of Hotel Operations Kamil Turczanski echoes that sentiment. "Randy is one of the most caring individuals I work with," he says.